Looking for that right girl to take on that long cruise well meet Lucille a restomod with a lot of style and curves. 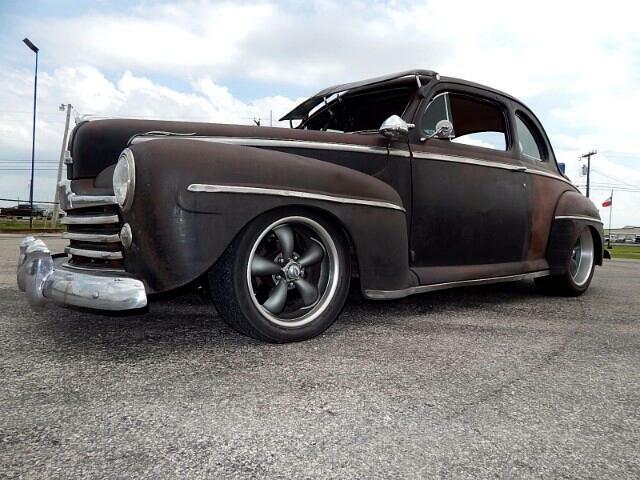 This reincarnation started out as a 1948 Ford Deluxe Coupe that was built by Kennedy's Hot Rod Shop In Selmer TN. This baby is powered by a Pace 300 HP Chevrolet Crate motor with a 700R4 Transmission All this is bolted to a Scott's Hot Rod Shop Ridetech suspension with 17" Coys on the front and 20's in the rear. A Walker radiator keeps the motor cool and a Vintage Air System Keeps you Cool On those hot summer nights. On the inside you will see deep rich leather seats done in that special color that looks like it belongs on the King Ranch that will keep you in the drivers seat for many miles.The Dash Has Been Beautifully Restored with Tilt Wheel for comfort. To Give This car that true classic look has the vintage Fulton sun visor. This girl has a lot to offer from short cruises to the long haul. Message: Thought you might be interested in this 1948 Ford DELUXE COUPE.